It’s been a banner year for U.S. capital market reform: on Wednesday President Obama is expected to sign the Dodd-Frank Act, while the SEC is receiving comments on its Concept Release for improving the process of proxy voting. Meanwhile, the SEC’s Investor Advisory Committee continues its work on behalf of shareholders, a role that becomes permanent once the ink dries on Obama’s signature. Earlier this year, the SEC’s guidance on climate change disclosure represented a giant step forward toward mandatory reporting on environmental, social, and governance (ESG) issues. And, the SEC requirement that companies use electronic data tagging – called “XBRL”, for eXtensible Business Reporting Language – now fully applies to all publicly traded companies, mutual funds, and credit rating agencies. With all this action, it’s easy to overlook an important area worth following: the “regular” proxy process whereby shareholders can communicate directly to companies their concerns on significant issues affecting important policy matters and governance. 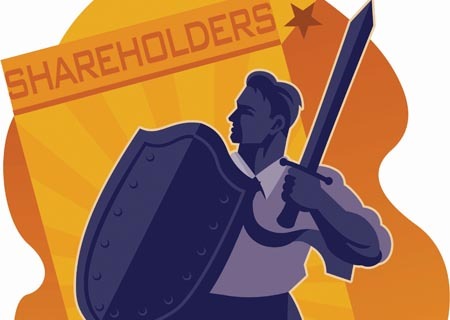 As long as they pass muster with the SEC, shareholder resolutions on an array of financial, social, and environmental topics are included in proxy statements. Proxy cards or voting instruction forms are included in these proxy materials, enabling shareowners to vote their preference. Corporate annual meetings – based on the New England tradition of town meetings – therefore become forums for debating these contentious issues as the votes are tallied. For social shareholder resolutions, the 2010 spring proxy season has been a banner year, too. Many environmental and social resolutions received record-breaking votes. While this isn’t a full reflection of all the work going on to improve corporate accountability in social, environmental, and governance areas – usually, when a decision is made to withdraw a resolution, a great deal of corporate dialogue occurs on the topic – the vote tallies for nonbinding ESG resolutions provide a good marker of shareholder sentiment and broader public policy concerns. 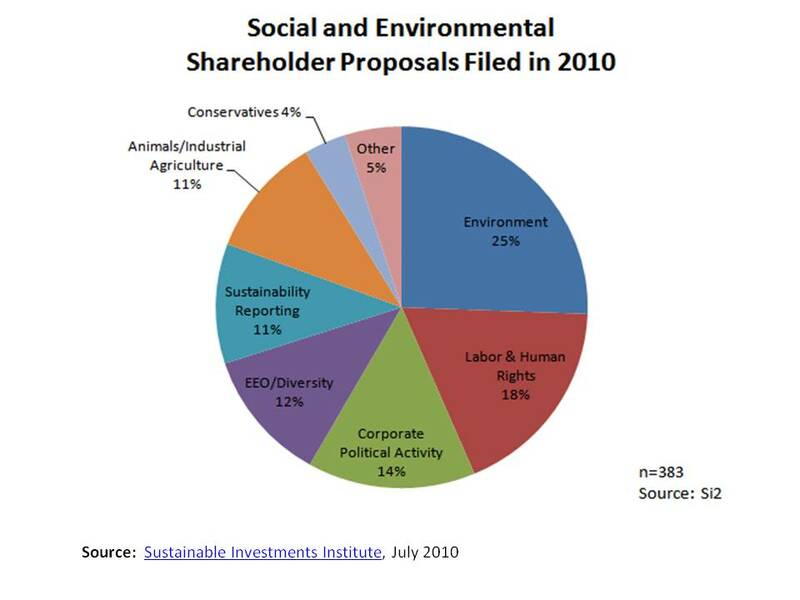 The Sustainable Investments Institute examined 383 shareholder proposals filed at companies for consideration in the first half of 2010, including all 165 that came to a vote. Welsh told us that their July analysis shows record investor approval for corporate policies protecting lesbian, gay, bisexual, and transgender (LGBT) rights, more reporting on sustainability in general and the environment in particular, and increased disclosure of political spending. The next two posts will examine in more depth the nature of these proposals, first (on Wednesday) in the environmental and social areas, then (on Thursday) those related to corporate governance. Please stay tuned! This entry was posted in Proxy Voting and tagged annual meetings, Bob Massie, Ceres, climate change, disclosure, Dodd-Frank, ESG, Heidi Welsh, Investor Advisory Committee, IRRC, Lane Christensen, mandatory reporting, Massey Energy, Peter DeSimone, proxy resolution, SEC, shareowners, Sustainable Investments Institute, XBRL. Bookmark the permalink.